1. My comments last week about the Italeri release schedule has had the desired effect! This week they released both the 1:72 Vertol H-21 #007 and the 1:48 RAH-66 Commanche #860. A new feature of the H-21 kit is the provision of a sheet of plastic mesh which you cut to size for the intake screens. For a first look review of the H-21 and scans of the instruction sheets and decal / paint diagrams visit AAA. And all the usual detail for modellers. 3. 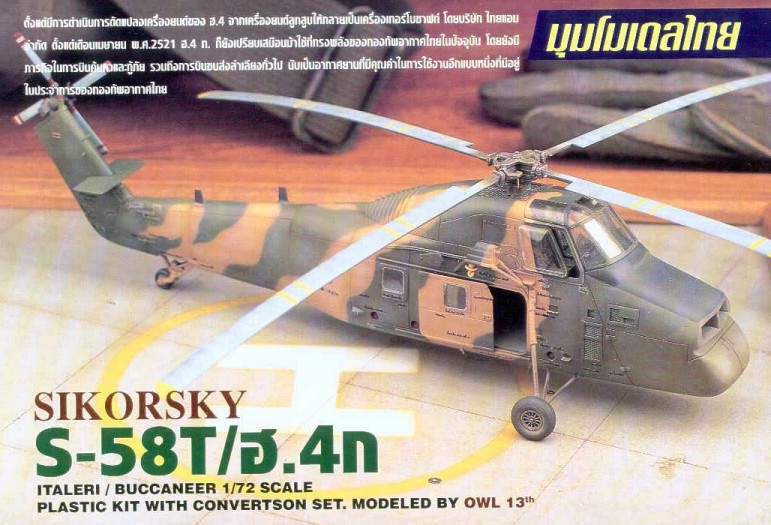 The Buccaneer S-58T resin conversion (HKN #44) was indeed produced in Thailand, and was advertised in the Thai magazine 'The Modeller Club' Vol.1. Unfortunately it appears to have sold out and the maker has no current plans to re-issue it. I am currently trying to obtain an address so that we can attempt to change his mind. I understand that a Thai Navy Seahawk conversion is planned for release by the same maker in August this year. 4. The long-awaited Max Decals sheet of 1:72 International Alouette III decals is now printed and should be available from stockists shortly. 5. The June 1999 issue of Replic, the French aircraft modelling magazine, includes a feature on the Italeri 1:48 UH-1D #849. 6. US readers note that Linden Hill now have the new AModel / Sky-High Ka-25C, which has decal options for both the USSR/CIS and Ukrainian Navies. 7. Michael Benolkin has posted a 'first-look' review of Revell's kit of the 1:32 EC-135 in ADAC colors, #4425. (Though it actually came out in 1997). Thanks to Michael Benolkin, Lam Chun Wing, Adam Cooper, and Joe Maxwell.